Excitement abounds for the new user interface! The UC Learning Center is getting a very helpful upgrade! 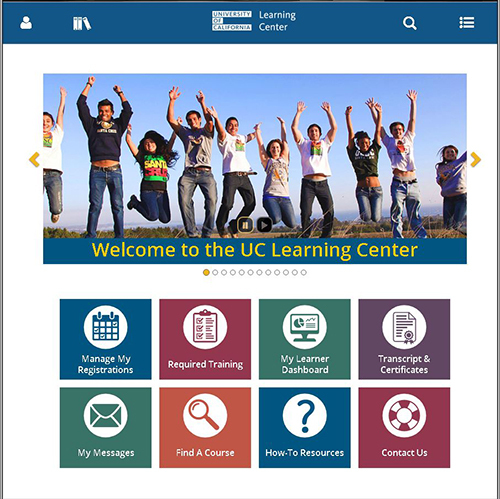 In the past, the University of California has purchased upgrades to our learning management software every few years. From now on, we will be subscribing to this software so we can have access to the latest version going forward. In order to implement this upgrade, the UC Learning Center will be offline from Friday, 7/28/17 at 5:00 PM, through Wednesday, 8/9/17 at 8:00 AM. So, if you have any UC Learning Center business to complete during that window of time (e.g. renewing certifications that may lapse), you can complete that business in the next few weeks, before the UC Learning Center goes offline. Direct links to trainings will be included within email notifications. Browser compatibility will be constantly upgraded, to keep up with global standards. An improved user-interface makes it easier to select the training you would like to take. A more intuitive search function helps you find what you’re looking for, even if you don’t type it perfectly (e.g. labratory vs laboratory).